The European Space Agency (ESA), established in 1975, is an inter-governmental organization dedicated to the exploration of space, currently with 17 member states. Its headquarters are in Paris, France. ESA has a staff (excluding sub-contractors and national space agencies) of about 1,900 with an annual budget of about €3 billion in 2006. ESA's spaceport is the Centre Spatial Guyanais (Guyana Space Centre) in Kourou, French Guiana, a site chosen because it is close to the equator from which commercially important orbits are easier to access. During the 1990s ESA gained the position of market leader in commercial space launches and in recent years ESA has established itself as a major player in space exploration. ESA science missions are based at ESTEC in Noordwijk, Netherlands, Earth Observation missions at ESRIN in Frascati, Italy, ESA Mission Control ( ESOC) is in Darmstadt, Germany, and the European Astronauts Centre ( PACI), that trains astronauts for future missions is situated in Cologne, Germany. Today space activities are pursued for the benefit of citizens, and citizens are asking for a better quality of life on earth. They want greater security and economic wealth, but they also want to pursue their dreams, to increase their knowledge, and they want younger people to be attracted to the pursuit of science and technology. I think that space can do all of this: it can produce a higher quality of life, better security, more economic wealth, and also fulfil our citizens' dreams and thirst for knowledge, and attract the young generation. This is the reason space exploration is an integral part of overall space activities. It has always been so, and it will be even more important in the future. GEOS-ESA, a satellite studying the Earth's magnetosphere, launched 1977, an example of early ESA space research activity. After the Second World War many European scientists had left Western Europe in order to work either in the US or the Soviet Union. Although the booming recovering process of the 1950s made it possible for Western European countries to invest into research and specifically into space related activities, Western European scientists realised solely national projects would not be able to compete with the two major superpowers. In 1958, only months after the Sputnik shock, Edoardo Amaldi and Pierre Auger, two prominent members of the Western European scientific community at that time, met to discuss the foundation of a common Western European space agency. The meeting was attended by scientific representatives from eight countries, including Harrie Massey (UK). 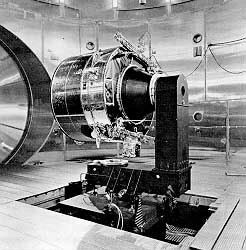 The Western European nations decided to have two different agencies, one concerned to develop a launch system ELDO (European Launch Development Organisation) and the precursor of the European Space Agency, and ESRO (European Space Research Organisation) that was established on March 20, 1964 per an agreement signed on June 14, 1962. From 1968 to 1972 ESRO celebrated its first successes. Seven research satellites were brought into orbit, all by US launch systems. The ESRO's successor organisation ESTEC (European Space Research and Technology Centre, based in Noordwijk, the Netherlands) is still a part of ESA, though ESA itself is a much bigger organisation today. The ESA in its current form was founded in 1974, when ESRO was merged with ELDO. The ESA was constituted of 10 founding members: Belgium, Germany, Denmark, France, United Kingdom, Italy, the Netherlands, Sweden, Switzerland and Spain . 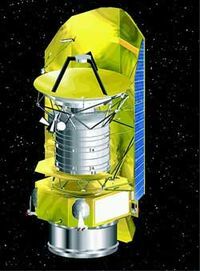 ESA launched its first major scientific mission in 1975, Cos-B, a space probe monitoring gamma-ray emissions in the universe. Beginning in the 1970s, when the space race between the US and the Soviet Union had tuned down and space budgets were cut dramatically in both superpowers, ESA established itself as a forerunner in space exploration. ESA joined NASA and the UK in the IUE, the world's first high-orbit telescope, which was launched in 1978 and operated very successfully for 18 years. A number of successful Earth-orbit projects followed, and in 1986 ESA began Giotto, its first deep-space mission, to study the Comets Halley and Grigg-Skejllerup. Hipparcos, a star-mapping mission, was launched in 1989 and in the 1990s SOHO, Ulysses and the Hubble Space Telescope were all jointly carried out with NASA. Recent scientific missions in cooperation with NASA include the Cassini-Huygens space probe, to which ESA contributed by building the Titan landing module Huygens. As the successor of the ELDO, ESA has also constructed rockets for unmanned scientific and commercial payloads. Ariane 1, launched in 1979, brought mostly-commercial payloads into orbit from 1984 onward. The next two developments of the Ariane rocket were intermediate stages in the development of a more advanced launch system, the Ariane 4, which operated between 1988 and 2003 and did establish ESA as the world leader in commercial space launches in the 1990s. Its successor, the Ariane 5 rocket, has established itself within the heavily competitive commercial space launch market since its first successful flight in 1997 and prospectively will reach 25 successful launches by 2006. Russia is ESA's first partner in its efforts to ensure long-term access to space. There is a framework agreement between ESA and the government of the Russian Federation on cooperation and partnership in the exploration and use of outer space for peaceful purposes, and cooperation is already under way in two different areas of launcher activity that will bring benefits to both partners. Most notable for its new self-confidence are ESA's own recent successful missions Smart-1, a probe testing cutting-edge new space propulsion technology, the Mars Express mission as well as the development of the Ariane 5 rocket. ESA has ambitious space plans that may be divided into three large categories. First, ESA will maintain its scientific and research projects (e.g. tests and developments of new propulsion systems), try to find ways to reduce costs for their rocket fleet while enhancing their capacities, honour its commitments regarding the ISS and engage in further space exploration like the Venus Express mission that was launched in late 2005. The second category has many parallels to NASA's plans and constitutes of astronomy-space missions such as the Planck Surveyor studying the cosmic microwave background (2008), the Herschel space observatory (2008), Corot that will be a milestone in the search for extrasolar planets and is due to launch in 2007 or the Darwin interferometer. While the projects described above are more or less similar in their structure and aim as NASA's and other space agencies' plans, the ESA's Mars project is different. The Aurora Programme lays out a time table for future missions to Mars, however in contrast to NASA's plans there is no emphasis on manned or unmanned lunar missions, it rather includes several flagship missions designed to develop and test technology needed for a manned European Mars mission currently planned for 2030. Among these flagship missions is ExoMars, a mission involving a Mars rover. Until 2005 ExoMars was planned to be a joint mission between NASA and ESA, however obstacles such as American technology law that prohibits sharing of classified space technology information led to ESA deciding to go for it alone. The mission is currently planned to launch in 2013. An even more ambitious Mars project is the Mars Sample Return Mission, that is planned as a follow-up mission to ExoMars. It will involve the first time a probe will return of samples from another planet, making it necessary to construct an ascent module that is capable of starting into Mars orbit and dock with the original probe. Among the action for returning to the society the investment, they have developed the SCOS 2000 satellite control centre, and they allow the use of it free of charge to any European firm. ESA comprises the national space organisations and other entities of these seventeen countries: Austria, Belgium, Denmark, Finland, France, Germany, Greece, Ireland, Italy, Luxembourg, the Netherlands, Norway, Portugal, Spain, Sweden, Switzerland and the United Kingdom. 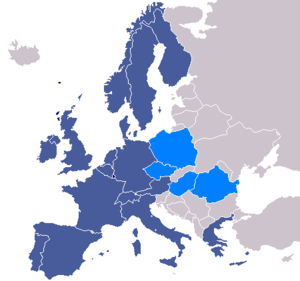 Hungary, the Czech Republic and Romania signed the five-year Plan for European Cooperating State (PECS), that is aimed at preparing the states for full membership. Their firms can bid for and receive contracts to work on programmes. The countries can participate in almost all programmes, except for the Basic Technology Research Programme. The membership fees are much lower than with full membership. Poland is likely to be the next to sign PECS documents. Since January 1, 1979, Canada has the special status of cooperating state with the ESA. By virtue of this accord, Canadian Space Agency takes part in ESA's deliberative bodies and decision-making and also in ESA's programmes and activities. Canadian firms can bid for and receive contracts to work on programmes. The accord has a provision ensuring a fair industrial return to Canada. Since China started to invest more money into space activities, the Chinese Space Agency has sought international partnerships. ESA is, beside the Russian Space Agency, one of its most important partners. Recently the two space agencies cooperated in the development of the Double Star Mission. All meetings of the agency are held in English, French and German, with translation provided. All official documents are also available in these three languages although other documents are only published in French and English. The ESA is not within the structures of the European Union (EU)—note that its membership contains non‐EU countries such as Switzerland and Norway. Switzerland and Norway are, however, within the EFTA. There are ties between those organisations, with various agreements in place and being worked on, to establish the legal status of ESA with regard to the EU. There are common goals between ESA and the EU, and ESA has an EU liaison office in Brussels. The budget of ESA was announced as €2.977 billion for 2005 (a ten percent increase on 2004) and for 2006 is estimated at €2.904 billion. A large part of ESA's budget is invested in ESA's launch vehicles that are currently the most expensive part of ESA's activities (Twenty-two percent of the budget goes into launch vehicles; human space flight is second in budget expenditures). In 2005, the three largest contributors, together funding two thirds of ESA's budget, are France (29.3%), Germany (22.7%) and Italy (14.2%). An important ministerial conference approved nearly all of ESA's budget requests in December 2005. The budget for the mandatory ESA programme, parts of the optional programme (i.e. optional for ESA's member states such as the ISS involvement) as well as important projects such as Aurora or the EU-backed Galileo navigation system have been approved. No decision has been reached with regard to ESA's involvement in the Russian Kliper project, a feasibility study worth €50 million was not approved. ESA's budget will stay at about the same, however inflation-adjusted, level as 2005 throughout the next 5 years. ESA member states fund separate national space agencies as well: Unlike the US, European nations maintain both national space programs and contribute to ESA's space activities. Most of those national space agencies have considerable budgets provided for scientific space research and other space related programs as well as joint projects with ESA or other international programs. For instance, the Italian Space Agency (ASI) has a national budget for 2005 of about €700 million, of which half is contributed to ESA and the other half is spent on its national or other programs. The German Aerospace Centre (German acronym DLR) has a separate budget for 2005 of €700 million The French space program in 2005 was funded with €1.7 billion, of which €685 million are contributed to ESA and the rest of appr. €1 billion to CNES's own budget and other national space programs. Taking these non-ESA space allocated funds of only those 3 major European countries together would amount to €2 billion. Would all ESA memberstates national space agencies be added together with ESA's budget would more than double ESA's €3 billion budget. ESA does not focus on human spaceflight: Only about 16% of ESA's budget are human spaceflight related (€500 million). In contrast considerable costs are incurred by NASA in maintaining the aging Space Shuttle. A single Space Shuttle launch costs more than $1 billion and during the last decades up to one-third of NASA's budget had to be invested in the Shuttle to keep it flying (for 2005, $5 billion are allocated for the Space Shuttle constituting 30% of the budget). Although ESA had plans for an own manned spacecraft such as Hermes, it has never actually developed or maintained a manned launch system, rather it has paid for seats on the American and Russian spacecrafts, and therefore was and is not focussing on a fully independent human spaceflight program. For a true comparison between the budgets and Europe's and the US' focus in spaceflight this difference should be taken into account, that is for all non-human space related activities ESA memberstates and the US are not very far apart in terms of budgets (NASA's budget without the ISS, Space Shuttle and other human spaceflight related activity is about $9 billion, ESA and ESA memberstates allocate about €4.5-5 billion (about $6 billion) to non-human spaceflight related space projects.) With NASA's commitment to the Vision for Space Exploration its focus on human spaceflight and budget expenditure for this segment of its space program will increase over the next decades. ESA has not stated that it intends to significantly enhance spending on human spaceflight. NASA's and ESA's administration structure is different: After the space race activities of the 1960s and early 1970s, NASA has maintained a large administration and bureaucracy that still burdens both current projects and NASA budgets. ESA was never involved in large-scale political activity such as the space race, it therefore has always had a small and efficient structure and agency level comparable to a private company, as only about 1900 people are directly employed by ESA and many projects are allocated over different organisations in several European countries, with ESA coordinating these projects but not directly employing the people involved in the project (decentralized structure). Both the US and Europe maintain space related projects outside their space programs: As it is the case with the United States as well, some highly expensive European space projects are not within ESA's budget, such as the Galileo global positioning system. Funding for this €4 billion project comes from special agreements between EU members and other international partners. Space related military spending both in the US and in Europe would increase space related spending if counted towards those entities' space related activity. In terms of absolute cash budget size, the ESA has the second largest budget after NASA, with the Japanese JAXA having annual funds of €1.6 billion at its disposal taking the third place, followed by the ambitious Chinese Space Agency with around €1 billion and the Russian Space Agency which incurred a considerable boost in funding in 2006 with an annual federal budget of $800–900 million. The Indian Space Agency has about the same amount of funds available as Russia. If not counted as part of Europe's total space budget (ex-Russian) together with ESA's €3 billion space budget (as outlined above) and other European space agencies, the French Space Agency would be in 4th place with €1.7 billion. One point in favour of the Russian Space Agency, the Chinese and the Indian space programmes, is that their budgets are growing rapidly largely stemming from the high growth rates of their economies, which leads to increasing amounts of money available with the government. It should be noted that space programmes have high labour costs, thus in order to compare the actual funds available for each space agency some adjustment with regard to purchasing power parity in each country should be made. As PPP is 5.5 for India and 4.5 for China, their space programme budgets are actually worth more than the absolute euro/dollar figures. Still, considering that Russia, Europe, the US, China, India and Japan are all competing in commercial space launches and costs for rocket launches are in the same range for all of the forementioned countries, it seems that a modifier lower than 4 or 5 would be warranted for a true comparison of national space funding. A very good example of the true comparison of funding is the Russian Space Agency which partly due to its large experience in LEO manned space flight but also due to a higher purchasing power parity could sustain a manned space program comparable to NASA throughout the last 15 years despite its dramatically lower budget. The Centre National d'Études Spatiales (CNES) (National Centre for Space Study) is the French government space agency (administratively, a "public establishment of industrial and commercial character"). Its headquarters are in central Paris. The Italian Space Agency (Agenzia Spaziale Italiana or ASI) was founded in 1988 to promote, coordinate and conduct space activities in Italy. Operating under the Ministry of the Universities and of Scientific and Technological Research, the agency cooperates with numerous entities active in space technology and with the president of the Council of Ministers. Internationally, the ASI provides Italy's delegation to the Council of the European Space Agency and to its subordinate bodies. The German Aerospace Centre (DLR) (German: Deutsches Zentrum für Luft- und Raumfahrt e. V.) is the national research centre for aviation and space flight of the Federal Republic of Germany and of other member states in the Helmholtz Association. Its extensive research and development projects are included in national and international cooperative programmes. In addition to its research projects, the centre is the assigned space agency of Germany bestowing headquarters of German space flight activities and its associates. The British National Space Centre (BNSC) is a partnership of the UK government departments which are active in space. Through the BNSC the partners provide delegates to represent the UK on the various ESA governing bodies. Each partner funds its own programme. ESA has made great progress towards its goal of having a complete fleet of launch vehicles in service, competing in all sectors of the launch market. ESA's fleet will soon consist of three major rocket designs, Ariane 5, Soyuz and Vega. Rocket launches are carried out by Arianespace, an ESA subsidiary (a minority share is held by EADS as well), at ESA's spaceport in French Guiana. Because many communication satellites have equatorial orbits, launches from French Guiana are able to take larger payloads into space than from other northern spaceports. In addition equatorial launches give spacecrafts an extra 'push' of nearly 500 m/s due to the higher rotation velocity of someone standing on the equator than near the Earth's axis where rotation velocity approaches nil. The Ariane 5 rocket is the primary launcher of the ESA. Its maximum estimated payload is 6–10 metric tons to GTO and up to 21 metric tons to LEO. The launch craft has been in service since 1997 and replaced the Ariane 4. The Ariane rocket exists in several specifications, the heaviest one of these is the Ariane 5 ECA that has been successfully launched in February 2005 for the first time, after it failed during its first test flight in 2002. ESA's Ariane 1, 2, 3 and 4 launchers (the latter of which was ESA's long time workhorse) have been retired. Soyuz is a Russian medium payload (ca. 3 metric tons to GTO) launcher to be brought into ESA service in 2007. ESA has entered into a €340 million joint venture with the Russian Federal Space Agency over the use of the Soyuz launcher. Under the agreement, the Russian agency will manufacture Soyuz rocket parts for ESA, which will then be shipped to French Guiana for assembly. ESA benefits because it gains a medium payloads launcher, complementing its fleet while saving on development costs. In addition, the Soyuz rocket—which has been the Russian's space launch workhorse for some 40 years—is proven technology with a good safety record, which ESA might be happy to use for launching humans into space. Russia also benefits in that it will get access to the Kourou launch site. Launching from Kourou rather than Baikonur will allow the Russians to almost double the Soyuz payload (3.0 tonnes vs. 1.7 tonnes), because of Kourou's closer proximity to the equator. Both agencies benefit from the long term strategic cooperation that in addition will be used to jointly develop future technology. It is perhaps worth noting that France (ESA's largest contributor) has historically had good relations with Russia, which contributed to reaching the agreement. Vega is ESA's small payload (ca. 1.5 metric tons to 700 km orbit) launcher; its first launch is planned for 2007. The leading ESA's member state for the Vega Programme is Italy contributing 65% of the costs. Vega itself has been designed to be a body launcher with three solid propulsion stages and an additional liquid propulsion upper module to place the cargo into the exact orbit intended. For a small-cargo rocket it is remarkable that Vega will be able to place multiple payloads into orbit. Jean-Loup Chrétien became the first Western European to fly into space. At the time ESA was formed, its main goals did not encompass human space flight, rather it considered itself to be primarily a scientific research organisation for unmanned space exploration in contrast to its American and Soviet counterparts. It is therefore not surprising that the first non-Soviet European in space was not an ESA astronaut on a European space craft: It was Czechoslovak Vladimir Remek who in 1978 became the first non-Soviet European in space (the first European in space being Yuri Gagarin of the Soviet Union) — on a Soviet Soyuz spacecraft, followed by the Pole Mirosław Hermaszewski and East German Sigmund Jähn in the same year. This Soviet cooperation programme, known as Intercosmos, primarily involved the participation of Eastern bloc countries, however in 1982, Jean-Loup Chrétien became the first western European cosmonaut on a flight to the Soviet Salyut 7 space station. Because Chrétien did not officially fly into space as an ESA astronaut, but rather as a member of the French CNES astronaut corps, the German Ulf Merbold is considered the first ESA astronaut to fly into space. 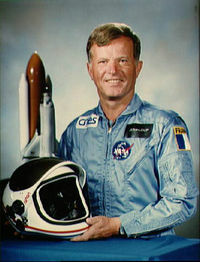 He participated in the STS-9 space shuttle mission that included the first use of the European built Spacelab in 1983. STS-9 marked the beginning of an extensive ESA/NASA joint partnership that included dozens of space flights of ESA astronauts in the following years. Beside paying for seats on the Space Shuttle, ESA continued its human space flight cooperation with the Soviet Union and later Russia, including numerous visits to Mir. During the latter half of the 1980s, European human space flights changed from being the exception to routine and therefore, in 1990, the European Astronaut Centre in Cologne, Germany was established. It selects and trains prospective astronauts and is responsible for the coordination with international partners especially with regards to the International Space Station. As of 2006, the ESA corps officially counts 12 members, including nationals from all the large Western European countries except the United Kingdom. Of this list Umberto Guidoni, Michel Tognini, Gerhard Thiele and Philippe Perrin have retired, which leaves 12 ESA astronauts in active status, among whom two, Fuglesang and Nespoli, have not flown yet. Claude Nicollier is scheduled to retire soon. In the 1980s France pressed for an independent European manned launch vehicle. Around 1978 it was decided to pursue a reusable spacecraft model and starting in November 1987 a project to create a mini-shuttle by the name of Hermes was introduced. The craft itself was modelled comparable to the first proposals of the Space Shuttle and constituted of a small reusable spaceship that would carry 3 to 5 astronauts and 3 to 4 metric tons of payload for scientific experiments. With a total maximum weight of 21 metric tons it would have started from the parallelly developed Ariane 5 rocket. It was planned solely for use in LEO space flights. The planning and pre-development phase concluded in 1991, however the production phase was never fully implemented because at that time the political landscape had changed significantly. With the fall of the Soviet Union ESA looked forward to a cooperation with Russia to build a next-generation human space vehicle. Thus the Hermes programme was cancelled in 1995 after about 3 billion dollars had been invested. In the 21st century ESA started new programmes in order to create an own manned spacecraft, most notably among its various projects and proposal is Hopper where a prototype built by EADS called Phoenix has already been tested. While projects such as Hopper are neither concrete nor to be realised within the next decade, a new possibility has emerged. Following talks with the Russian Space Agency in 2004 and June 2005 a cooperation between ESA and the Russian Space Agency was announced to jointly work on the Russian designed Kliper shuttle, a reusable spacecraft that would be available for space travel beyond mere LEO (e.g. the moon or even Mars). Kliper constitutes the Russian counterpart to the American Crew Exploration Vehicle programme. Kliper may see its first launch as early as 2012. It was speculated that Europe could finance part of it (development costs have recently been announced as 16 bn rubles which amounts solely to around €500 million) and that it would even be possible that the lighter version of Kliper take off on an enhanced Soyuz rocket from both from French Guiana and Baikonur. However a €50 million participation study for Kliper, which was expected to be approved in December 2005, was finally not validated by the ESA member states. As a consequence, the participation of ESA remains an outstanding question. The situation is that the executive of ESA and its Human Spaceflight Directorate support Kliper, while the main contributing countries, and in particular Germany, Italy and France, oppose the initiation of a new human space transportation project that would have ESA only be a junior partner in any project. Jean-Jacques Dordain has hinted that a decision on ESA's involvement in the project could be made as soon as June, 2006. In June 2006 ESA memberstates granted 15 million to the Advanced Crew Transportation System (ACTS) study, a two year study to design a spacecraft capable of going beyond LEO. This project is pursued with Roskosmos and has been labeled a successor-project to Kliper. A decision on the actual implementation and construction of the ACTS spacecraft is contemplated for 2008. The Columbus orbital facility is a module of the International Space Station(ISS) that ESA developed. With regard to the ISS ESA is not representing all its member states: 5 of the 16 countries have opted out because of either concerns on the expenses of the project or lack of interest. ESA is taking part in the construction and operation of the ISS with contributions such as the Columbus orbital facility, a science laboratory module that will be brought into orbit after NASA's Space Shuttle goes back into service or the Cupola observatory module that was completed in July 2005 by Alenia Spazio for ESA. The current estimates for the ISS are approaching €100 billion in total (development, construction and 10 years of maintaining the station) of which ESA has committed itself to pay €8 billion. About 90% of the costs of ESA's ISS share will be contributed by Germany (41%), France (28%) and Italy (20%). German ESA astronaut Thomas Reiter is currently the first long-term ISS crew member. As of 2005, the spacecrafts that establish the supply link to the ISS are the Progress and Soyuz spacecrafts as well as the Space Shuttle. 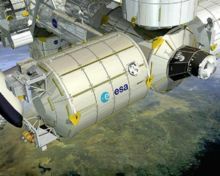 The European Space Agency has started to construct a space freighter for the ISS, the ATV, an Automated Transfer vehicle with a cargo capacity of 8 metric tons that will be serving the ISS beginning in July, 2007. With the Space Shuttle reaching its retirement age in 2010, until NASA has a replacement for it such as COTS (the CEV is not expected to make its first operational manned flight before 2012) the ATV together with Progress, Soyuz and the Japanese transporter HTV (which will be ready in 2009) will be the only links between Earth and the ISS. Artemis — Europe's most advanced telecommunication satellite. Cluster-2 — a group of four probes studying the magnetosphere. Double Star Mission — probe to study effects of the sun on Earth (in cooperation with the People's Republic of China). Envisat — is the world's largest and most complex environmental satellite. ERS-2 — is an earth-observing satellite launched in 1995. It is the successor to ERS-1. GIOVE-A — Experimental satellite launched Dec 2005 as forerunner for the Galileo positioning system. Hubble Space Telescope — built and operated in cooperation with NASA. Integral — is the first space observatory that can simultaneously observe objects in gamma rays, X-rays and visible light. Mars Express — a space probe to Mars. MetOp-A — is the first polar orbiting satellite dedicated to operational meteorology. A satellite to study temperature and humidity, wind speed and direction, ozone and other trace gases on Earth. Rosetta — a space probe launched in 2004 that will explore comet 67P/Churyumov-Gerasimenko in 2014. SOHO — a space-based observatory to study the sun (together with NASA). Ulysses — built and operated in cooperation with NASA. XMM-Newton — an X-ray observatory satellite. Venus Express — a space probe to Venus which was launched in Nov 2005 and arrived in orbit around Venus in April 2006. CryoSat — a three-year radar altimetry mission to determine variations in the thickness of the Earth’s continental ice sheets and marine ice cover. In October 2005 the launcher failed and CyroSat was lost. ESA is evaluating the cost of rebuilding the lost satellite, and, if funds are available, it may be able to launch it in about 3 years time. KEO — ESA is sponsoring the KEO satellite, which will carry messages addressed to future inhabitants of the planet Earth (a time capsule expected to return in the year 52006). Cos-B — first project of ESA after foundation (in 1975). Giotto mission — first deep space mission of ESA, which went to Comet Halley. Hipparcos — a space-based astrometry mission. Huygens probe — a space probe to Saturn's moon Titan. ISO — Infrared Space Observatory. IUE — ultraviolet astronomical space observatory. SMART 1 — a lunar spaceprobe testing new propulsion technology. European Space Astronomy Centre ( ESAC), Madrid, Spain .